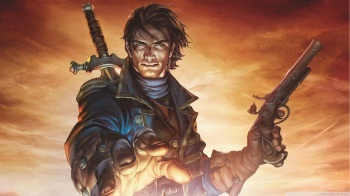 Those of you with Xbox Live Gold subscriptions can now download Fable III totally gratis, thanks to Microsoft's new "Games With Gold" initiative. During Microsoft's E3 press conference the company announced that it would be swiping a page from Sony's playbook and offering those who subscribe to Xbox Live Gold a selection of free downloadable titles that initially debuted as $60 retail games. The first title in this effort is Fable III, and as of this very moment the Lionhead roleplaying game can be found on the Xbox Live Marketplace with a very attractive $0 price tag. The only caveat here is that this particular leg of the promotion only lasts until June 30, so if you want to pick up Fable III for free, you'll need to do so within the next two weeks. Though the promo has a near-term expiration date, the game itself has no such thing, and once you've downloaded it for free, you own the title until such a time as you decide it's occupying too much space on your Xbox 360's hard drive. In a big picture sense, the real story here isn't the free game, but is instead Microsoft's attempt to go head to head with Sony in this particular promotional realm. While it's always great for a company to offer consumers free stuff in an effort to generate good will, Microsoft has a long way to go before it's caught up with Sony's Instant Game Collection, which is a constantly revolving line up of some of the best PlayStation 3, Vita and PSP titles to have ever been released. We have to assume that Microsoft has more elaborate plans for the Games With Gold initiative, but that raises the question of what exactly the company would have to offer to tempt those without Xbox Live Gold subscriptions to sign up for one. This is where you guys come in. The comments section is below. If you're not an Xbox Live Gold subscriber, tell us what could change that. Or, alternately, write a few hundred words about how much you hate Microsoft. Whichever option blows your skirt up.